Today Her Majesty Queen Margrethe II of Denmark celebrates her 69th birthday. 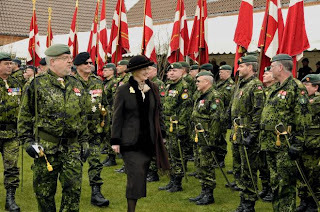 Sovereign of the oldest monarchy in Europe the Kingdom of Denmark is certainly something special and Queen Margrethe II has always been one of my favorite monarchs. She has maintained the highest standards of dignity and royal duty while always remaining down-to-earth and approachable. She is known for her talents as an artist but I must admit that I like her most when she is standing up against pressure from those who love to feign outrage. She is her own woman and will not be bullied into anything as is evidenced by her refusing to bow to media pressure to quit smoking or her retort to an anti-fur protestor that, "people can wear what they like". It seems the Queen of Denmark might have a libertarian streak in her. She has also impressed me with her frank openness about dealing with immigration and radical Islam. Her positions have never been outrageous nor have they gone too far in any direction but it says alot when she is criticized in some quarters simply for addressing the issue honestly and pointing out that (gasp) problems do exist. Queen Margrethe II is a very intelligent, highly educated woman, a dame of the Spanish Order of the Golden Fleece and a lady of the Order of the Garter and the colonel-in-chief of the Princess of Wales Royal Regiment in the British army. Her Royal Family is also very significant in European monarchy as a whole for the number and extent of their relations across the thrones of Europe. She is a great lady, a great monarch and I join all others in wishing Her Majesty a happy birthday.